It seemed much bigger, more spacious out of that closet nook. So much room to decorate and put out cute little desk accessories and such. The gray matched the gray of my curtains and inspiration board (not pictured). 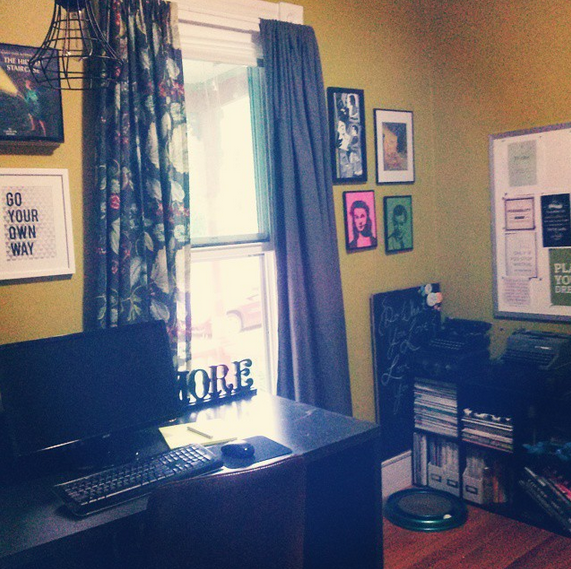 The office is on the small side and the desk took up so much valuable floor space. Since the desk was so huge and the electrical outlets limited, it was hard to position it just right. You can see in the photo above that it overlapped my window quite a bit. In my last place, I never sat at the desk long enough to realize just how it was. Since I spend several hours writing or blogging in my office, I quickly realized that the height of the desk wasn't right for me. My wrists rested awkwardly on the edge, cutting off circulation. 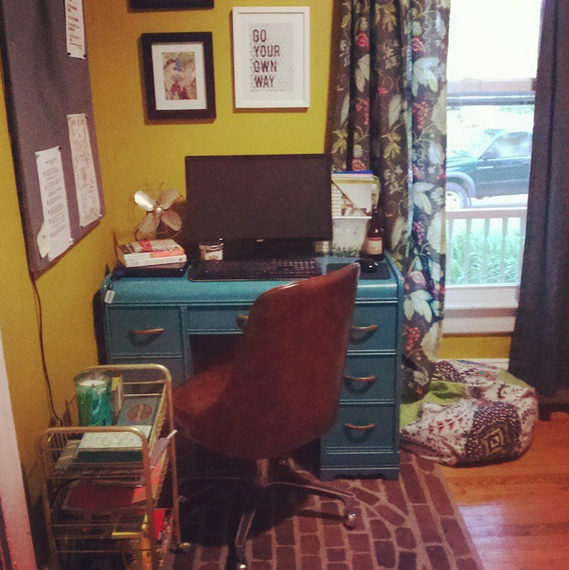 Two hours away in my hometown, at my parents' place, in my sister's bedroom sat a little turquoise desk I'd scored at an antique shop when I was in high school. I hadn't used it during all my years of college, so I'd almost forgotten about it. Where to go with the big desk? Luckily my boyfriend is tall and it's the perfect height for him. So he was totally willing to take it off my hands to replace the little desk he'd been wanting to get rid of. Doubly luckily, he has a truck and was totally willing to haul my turquoise desk up for me. Of course, there just had to be torrential rains the day we brought the desk back. And we had to stop like five times on the ride home to re-adjust the tarp. But my lovely little turquoise desk made it all in one piece and with no water damage. It's a big downsize, isn't it?! It takes up less floor space but offers more storage space. See how it fits just perfectly on that sliver of wall without blocking my view? I love that. It's just the right height. Plus, the section where my wrists actually rest is curved... so no more sacrificing my circulation in the name of writing! It looks a little cluttered above because I hadn't found spots for everything that sat on my old desk, but less space on my desk top means less things to get distracted by. It's a great place to sit down and focus. Perhaps my favorite thing about this desk is its turquoise color. To know me is to know that I love me some turquoise. And I was surprised by how the turquoise brightened up the room versus that charcoal. The brass handles are so gorgeous, too. Did I mention drawers?! I missed those. The minimal, modern Ikea desk lacked 'em. I'm still finding places for all the things I had spread out over my larger desk. Some things are just too pretty to stuff away in a drawer, but I'm working on de-cluttering. Sometimes, a love affair with a certain type of furniture just isn't meant to be. Turns out, I'm truly a small, antique writing desk kinda girl at heart. 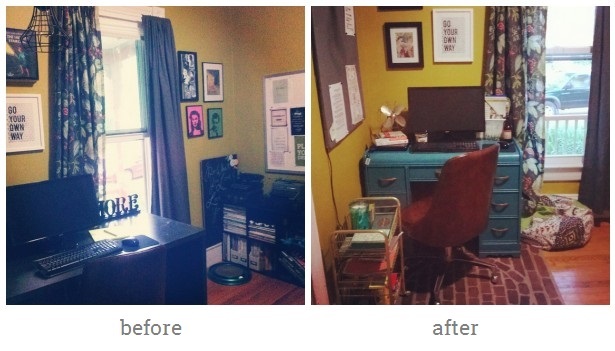 Have you ever downsized to a smaller desk, dresser, or other piece of furniture and turned out much happier in the end?